Roughing it is nothing new to Boy Scouts. But some roughing it is rougher than others. 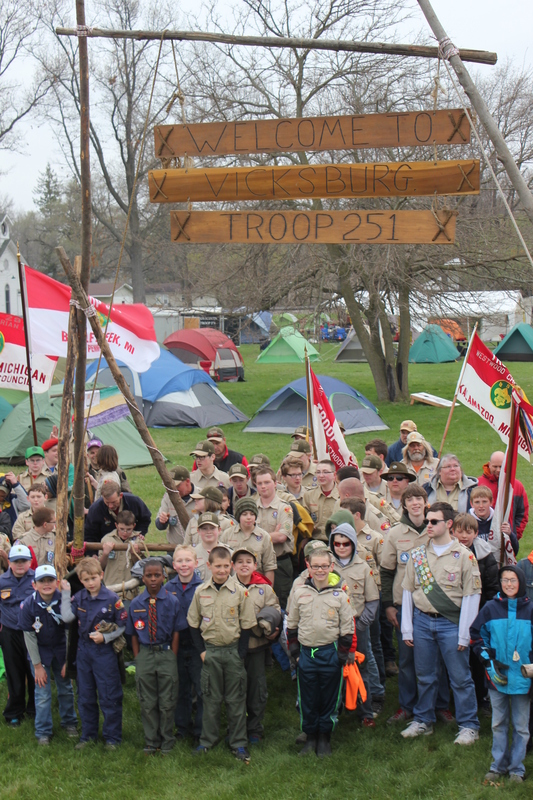 Weather was the challenge for the troop’s 75th anniversary camporee, Saturday, April 25 at the Vicksburg Historic Village, according to Kevin Borden, Vicksburg’s Troup 251 Scoutmaster. Cold, rain, and wind greeted the 150-plus campers when they crawled out of their tents after sleeping overnight on the ground in pup tents. They cheerfully gathered for flag raising and breakfast, then launched into their service project for the morning. The scouts were dispersed to the many areas of the Historic Village where they were met by members of the Victorian Garden Club. Members guided the boys in weeding, raking, and cleaning up the grounds during their annual spring clean-up. Later in the day, Borden promised to make this one of the community projects for the scouts as they recognized how much their help was appreciated by the ladies who do this work every year. The usual roughhousing that boys from ages seven to 17 experience in the out of doors was guided by adult scoutmasters from all over this area. Troops from Schoolcraft, Richland, Battle Creek, Portage, Kalamazoo, and Vicksburg’s Troop 253 sponsored by Lakeland Church, joined in to celebrate the 75th anniversary. One highlight for the scouts was a visit from British Revolutionary War reenactors. They came from Kalamazoo, Indiana and Ohio in costume to educate young and old on what camp life was like in the 1870s. They represented the British Army’s 84th Regiment of Foot that served at Fort Michilimackinac on Mackinac Island. Capping off the day was a tug-o-war, outhouse races, hatchet toss, branding station, marshmallow shooting, and fire truck display. 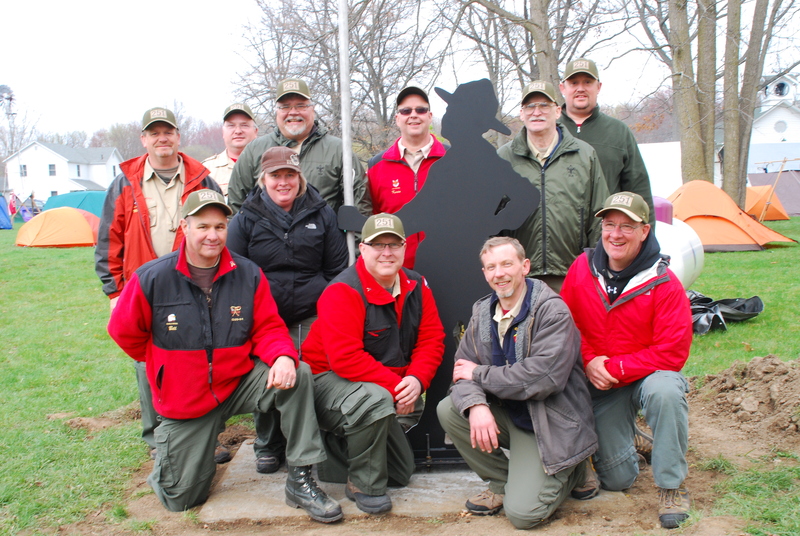 A dedication ceremony for a scout silhouette and unveiling beside the historic township hall in the village brought all the troops together. The sculpture was created by Landscape Forms in Kalamazoo. It has a flagpole coming out of the extended arm of a scout in silhouette. Jim Willoughby of Kalamazoo, and a legendary scoutmaster in his own right, portrayed Robert Baden-Powell in uniform, including the campaign hat featured in the sculpture, as the founder of Boy Scouting. The scouts and their guests listened with rapt attention to his recitation of how scouting was born and its focus on outdoor activities and survival skills. Leaders of Boy Scouts Troop 251 and Cub Scouts 251, assemble by the sculpture that was installed at the Historic Village during their camporee in April. The evening featured roast pig for all the campers, a Dutch oven cobbler competition and finally a movie in the Historic Village Pavilion. By Taps and lights out at 11 p.m., not many were stirring anywhere on the camp grounds, according to Kip Young, one of the primary organizers of the event. Leaders of Troop 251 vowed to move the camporee to the Historic Village permanentlyS after seeing how well it was received by campers and the community. 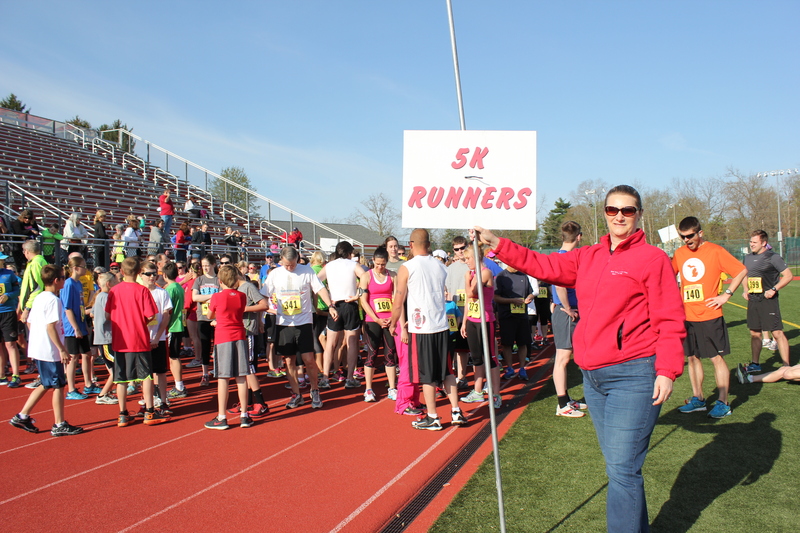 Kim Kline of the Vicksburg Community Schools Foundation holds the sign directing the runners in the 2014 Hearty Hustle. Come Saturday morning, May 9th, you will see people swiftly running and briskly walking through the streets of Vicksburg as the 28th Annual Hearty Hustle 5K Walk/Run takes off. The race begins at 9 a.m. at the high school, loops through the village of Vicksburg and back to the stadium where Athletic Director, Mike Roy announces participants. “It’s an enduring event that sets the standard for 5K races. This event is the hallmark of fun, health, and fellowship,” says Tonya Nash, the chief organizer of the event, as the community education director for the district. She heads a coalition of partners including Vicksburg Community Schools Foundation, Bronson Vicksburg Outpatient Center, the Village of Vicksburg and the Vicksburg Community Schools. The 5K walk/run course winds through the scenic streets of the Village magically missing the railroad tracks. The fun walk is approximately one mile in length and invites folks to just get out and get moving, according to Nash. The entry fee is $11 ($9 for senior citizens and elementary students) if registering online before May 7. It goes up to $25 on race day, so it pays to think ahead and register now at www.runsignup.com/vicksburgheartyhustle. 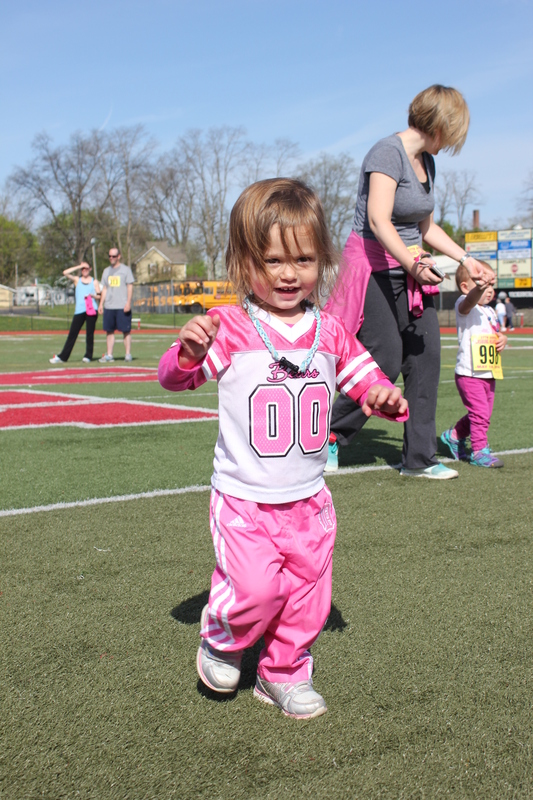 Every child was a winner in the Baby Bolt. New this year, nine registration scholarships have been donated to the three elementary schools as rewards for amazing effort and perseverance in Physical Education. The recipients this year are: Keyana Szabo, Anthony Holleran, Avram Lipford, Olivia Curtis, Lucy Glerum, Dylan Zemitans, Reed Tassell, Katara Rosol, and Anna Meschke. The Tina Hayward Inspiration Award recognizes a male and female runner in the master class, sponsored by Leon Hayward. Always a surprise is the Hollenbeck Volunteer award winner as well as the Carl Bennett Photo Moment award, which is given at the end of the race to someone who has run the race in creative attire or has a light-hearted attitude. Mac Sports Timing will be ensuring everyone has a posted time, and the 36 top and divisional winners are acknowledged. All proceeds from the race will go toward the Vicksburg Community Schools Foundation for the many functions it sponsors during the school year. It is going to be a great event – the Vicksburg Hearty Hustle – one beat.one step.one race. 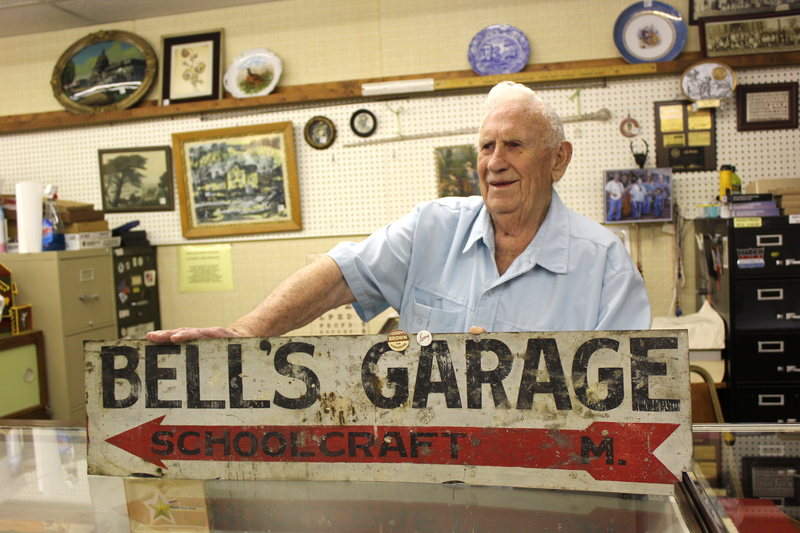 Carl Tackett displays an original sign that points to Bell’s Garage which was located in the wooden building to the north of his current home. After celebrating twenty-eight years as an antique dealership in the Bell Building on Grand Street in Schoolcraft, Carl Tackett, owner of T & W Coin store and Norma’s Antiques, is closing up shop. The store has occupied three buildings that were built by Lewis Bell in the 1890s and over the years have housed a meat market, a telephone exchange, and a movie theater. The Tacketts moved from a store front in Portage to Schoolcraft when the owners of Portage Plaza raised the rent beyond what Carl was willing to pay. With the help of friends, all the stock was moved in one day to Schoolcraft; just one dish was broken. When Norma, Carl’s wife of 45 years, passed away in the fall of 2014, her antiques occupied all corners of the vast Opera House upstairs, the basement, and the main floors fronting on Grand Street. Carl is selling all the antiques at auction in Illinois. It has taken 12 truckloads so far to move these valuable antiques without making much of a dent in the remaining stock. The auction house will not let him help with anything in the moving and packing of the inventory. Norma was known worldwide for her knowledge of antiques, drawing customers from as far away as Europe and Japan. Together, the Tacketts put Schoolcraft on the map as a center of antique shopping with help from employees who will also be retiring. The couple started the Christmas Walk in Schoolcraft that brought shoppers from far and wide to enjoy the small town atmosphere and the warmth of Christmases past. Melvin’s Hardware was there for many years in the middle of the 20th century…..oldies remember this fondly. Folks would gather there to watch the first TV in town sitting on washers, dryers and whatever was near…old and young alike! Carl has been active in the community too, having served nearly 20 years on the village council. He personally oversees the village-sponsored garage sale every spring. He is very proud of the sidewalk program the village instituted years ago. He now spends three days a week on dialysis at the Three Rivers hospital, so his health has been a concern for the many people who stop by to chat each day and try to keep him from being lonely. He will meet with coin collectors by appointment but doesn’t plan to keep his portion of the shop open for walk-ins. Tackett moved from Marion, IN in 1966 to work at the GM plant on Sprinkle Road. He has three children from a previous marriage. He met Norma who had two children but was single when he hired her to do accounting work for the UAW local; he served as the local’s financial secretary. They started the antique business when a business in Detroit closed. They purchased the inventory and moved it to a flower shop they owned in Battle Creek. Carl kept his day job at GM until he retired in 1986. The building to the right is the oldest wooden building in Schoolcraft. Constructed in the 1840s, it survived a devastating fire that took all the other buildings south of it. When they were rebuilt by Lewis Bell around 1896, they were constructed from brick. Schoolcraft’s post office was located here and later moved to Hayward St. Before the building was known as Norma’s Antiques it was called “Bell’s Opera House”. A stage was located on the second floor and many balls, dances, high school senior plays and operettas occurred in it. There were stores on the first floor and the public area on the second floor even saw high school basketball games until 1938. There were two posts in the middle of the floor; players dribbled around them to get to the support posts on either end to score a basket. No cars, but electric lights and either telegraph or telephone poles can be seen in the photo. The stone for the Bell Block is still at the corner of Hayward and Cass in the grass area owned by the Kalamazoo County State Bank. 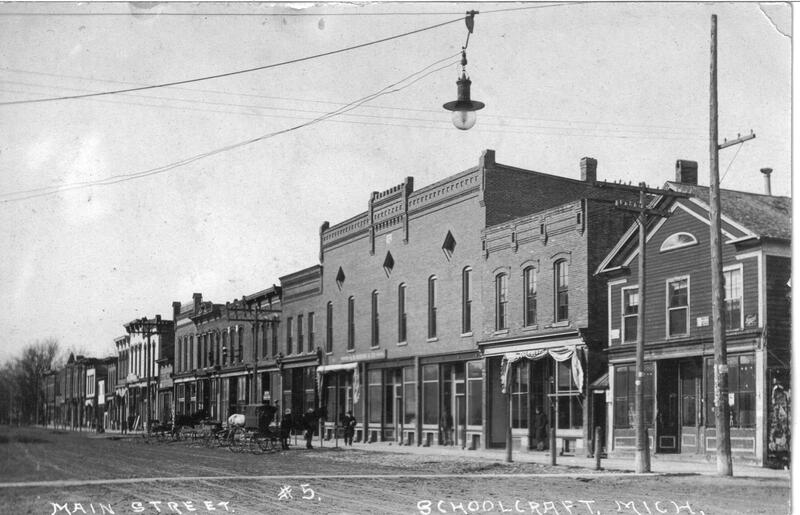 Photo and content courtesy of the Schoolcraft Historical Society. If you have an old photo to share, email it to Steve@swmspark.com. 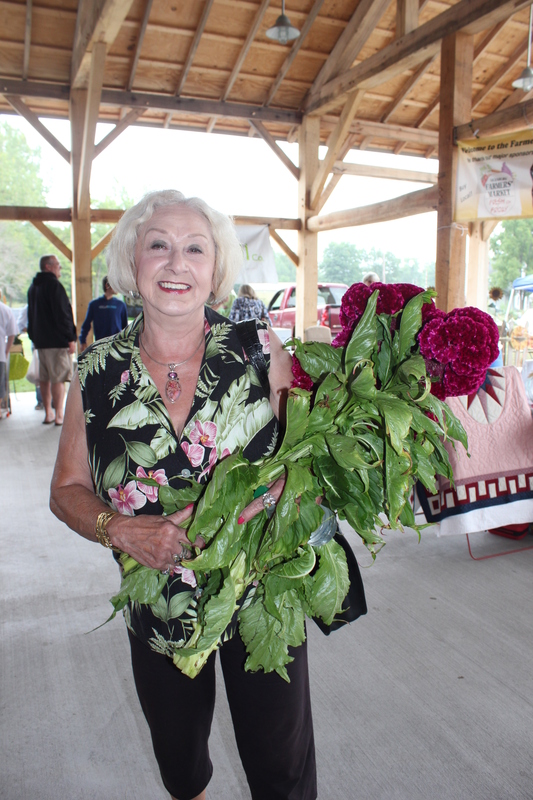 Marilyn Pagels found the flowers she didn’t actually grow in her own beautiful garden on Spring Road, at the Vicksburg Farmers’ Market in 2014. The “open for business” sign goes up for a second year at the new pavilion on Richardson Street for the Vicksburg Farmers’ Market from 2:30-6:30 p.m., May 22. It’s the market’s sixth year as a purveyor of locally grown fruits and vegetables along with specialty items such as baked goods, coffee beans, granola bars, handmade soaps, and mushrooms. There are some new vendors for market visitors to inspect, along with many who have been with the market since its inception located at the former Bobby’s drive-in restaurant. Carol Meyer-Niedzwiecki has been recruited to become the co-market manager, taking Stella Shearer’s place for the 2015 season. The market has been graced with area musicians each week, coming to play for the customers as the browse. They are from the Kalamazoo Folk Life Society and offer their services for free, but do put the hat out for contributions. June Kucks, a Vicksburg member of the society, is handling all the arrangements. Charlie Burgstahler will do the honors on May 22. He plays guitar and Harmonica. Jim Jager will be holding forth on May 29, playing guitar and singing in his easy listening style. Kids Plate, organized by Carol LaFrance and Penny Allen will be back again on the third Friday of June, July and August. She is also planning a presentation in partnership with Rise and Dine entitled “Eating Healthy on a Budget.” LaFrance is president of the nonprofit market. A new parking arrangement has been drawn up by Don Wiertella and John Polacek, former MDOT engineers. It was approved by the village, the Market Board, and the Lions Club in April. Customers will continue to enter from Spruce Street, though at a new entrance stretching directly east and west close to the Heritage Garden. Parking will be off the newly graveled road and on Spruce St., with the hope that grass will take hold on the east side of the pavilion where the Lions Club usually conducts its volleyball tournament in July. Over 225 cubic yards of donated top soil has been trucked in from the Allen Edwin building development to cover the east side, replacing gravel and broken glass shards following construction of the pavilion. The first year in the pavilion saw a large increase in the number of customers and vendors who liked to be under cover in the pavilion. The Vicksburg market is one of the largest in the area and has gained a stellar reputation among those who love fresh vegetables and fruit each week. The variety of offerings has been a big draw, with the market hitting over 950 customers on a warm day in August of 2014. It is a nonprofit organization, run by volunteers who have put in countless hours to help make it run efficiently. SNAP, Double Up Food Bucks, Senior Fresh, Project Fresh, WIC, and Generous Hands coupons will be honored again in 2015. Faye Van Ravenswaay, library director, and Debra Christiansen, president of the Friends of the Library, greet people at their volunteer appreciation event. 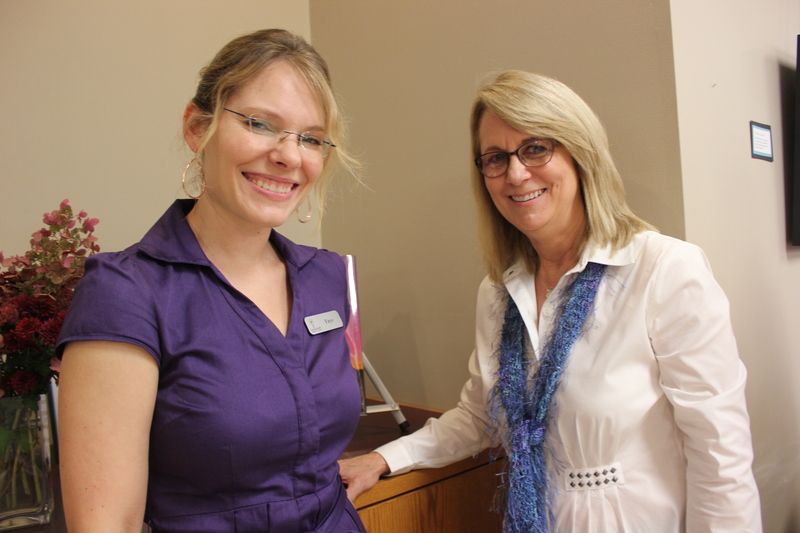 Volunteers form the heart and soul of the Schoolcraft community work force in many special ways, according to one who knows–Faye Van Ravenswaay, director of the Schoolcraft Library. Her organization plans to recognize its many faithful volunteers during the week of April 12-18. The Friends of the Library (FOL) hold several annual events to raise money for the library and plug for the recognition of the library in the Schoolcraft community. They sponsor the Jubilee of Trees, the Book & Bake Sale in April and a summer family-friendly program in July that is usually held in Burch Park. Their dedication, commitment, and fundraising expertise enable the library to provide programming for all ages, such as the popular summer reading program, as well as purchase books, materials, and other exciting technology that benefit the community, according to Van Ravenswaay. The library staff and its board wish to publicly express gratitude for the volunteers many years of service in support of the library with this public recognition. Laura Howard, a two-time past president of the Vicksburg Rotary Club, was nominated as its Rotary Hero of the year. She will be honored at the District 6360 annual meeting along with 46 Heroes from other clubs in Southwest Michigan at the district’s May gathering. One of the criteria is length of service in the club and the impact that service has had on the club. In that, Howard excels according to Warren Lawrence, the only other two-time past president. “She is task oriented, accepts jobs readily whenever given an assignment. I know they will always be carried through in complete detail, with the task accomplished perfectly. She is a multi-faceted person, with lots of enthusiasm for giving back to her job and the community,” he commented. Howard was the first women admitted to the club after Rotary International lifted the ban on women members in 1990. She moved up through the chairs to become the first woman president of the club in 2000, then served a second term in 2001/02. “There were a lot of changes at that time in the officers of the club, so they asked me to stay on one more term. The job was bigger than I anticipated but enjoyable, she said. She was selected as a Paul Harris Fellow in 2007, an honor the club bestows once a year on its most outstanding citizen. 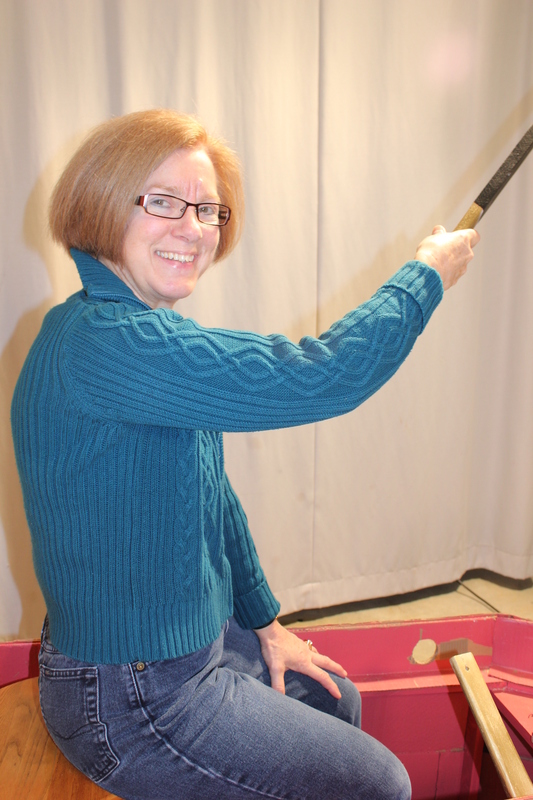 She has been behind the scenes in the Rotary Showboat production every year since joining, serving on ticket sales, programs, advertising and ushering. For the last few years she has operated the spotlight for each performance. Outside of Rotary she is the system director for Bronson Hospital’s ProHealth, Rehabilitation, and Vicksburg Outpatient Clinic. She started her career at Bronson Hospital 38 years ago and moved to its Vicksburg facility in 1985 as a social worker for the rehab unit, rising to oversee the entire Vicksburg operation. As the face of Vicksburg’s United Way campaign for over ten years, she has steered the fundraising and allocations decisions, and served on the Greater Kalamazoo United Way board before it combined with Battle Creek. She also served on the Goodwill Board of Directors.